Dom Telford bagged a hat-trick as the Development Squad claimed a 3-1 victory over Swindon Town Under-23s on Tuesday afternoon. The frontman gave Rovers the leads just moments before half-time with a powerful drive and then notched a second on 75 minutes with a nice half-volley. Swindon pulled one back with seven minutes left on the clock but any threat of a comeback was quickly scuppered when Telford completed his hat-trick from the spot after Owens was clipped inside the box. The result leaves Chris Hargreaves’ men well in the mix for the Central League title, with just two games remaining. Telford, who has so often been prolific for the Development Squad, got straight into the action and tested the keeper out almost immediately, stinging his palms with a low drive from range. Shortly after Kunle Otudeko showed good skill to beat his man down the left and backed it up with a dangerous low ball across the six yard box that his fellow winger Mo Baghdadi was close to getting on the end of. Rovers had definitely started the brightest and seemed to be getting some joy down the left, with Kris Owens getting forward from left-back and forcing a stretched parry from the keeper off a powerful shot. Just after 10 minutes, Swindon got their first and two big chances to take the lead, getting in behind off a long ball and lobbing Liam Armstrong only for the ball to bounce just wide and then getting one-on-one again however their striker scuffed his shot wide. 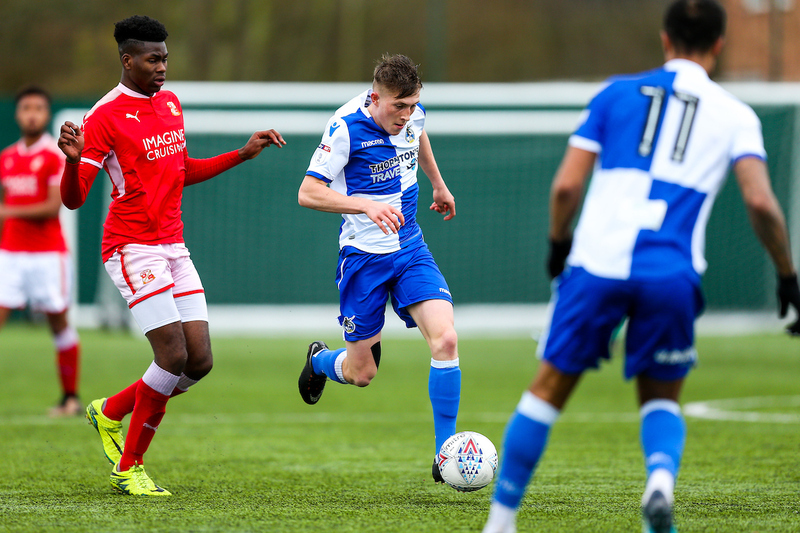 The game had quickly become end-to-end stuff and Rovers rattled the crossbar when Otudeko followed in Telford’s saved effort but couldn’t keep his strike down. The Robins did have the ball in the back of the net just past the 20-minute mark, however the linesman had raised his flag for offside and as such, it didn’t count. Rovers then had a penalty shout turned down, with Telford being man-handled at a throw-in but the referee wasn’t convinced. The game had started to plateau towards the break, however Rovers took the lead just a couple of minutes prior the interval, as Telford stole in front of a defender to get himself one-on-one to the left of the box and drove a powerful shot above the keeper and into the net. Five minutes into the second half Telford had a great chance to double his and Rovers’ tally, getting on the end of a superb back post cross from deep by Owens but the forward couldn’t quite keep his cushioned half-volley on target. That marked a spell of ascendancy for Hargreaves Snr.’s men, with Otudeko flashing an inviting cross across the face of goal that the outstretched legs of both Ebbutt and Baghdadi couldn’t quite connect with. Telford did have the ball in the net for a second time, however was halted by the linesman’s flag after he’d helped home Otudeko’s low cross; an impressive feature of the winger’s afternoon to this point. Otudeko then won a free kick in a decent position, which was whipped towards the left corner by Telford and smartly stopped by Town’s keeper. The striker continued to be at the forefront of the action, testing the keeper once again with a smart turn and strike on the edge of the box. Today’s Trialist and Baghdadi combined well on the right to get into the box before setting Hargreaves for a volley that was desperately blocked and sprung a counter for Swindon who found themselves in on goal, but Kelly got back in well to clear a stabbed effort that had passed Armstrong off the line. Otudeko had been a threat throughout and showed his skill, ducking and diving in the area before finding a yard for a strike that demanded a good stop from the keeper low to his right. The resulting corner was met close in by the unmarked Telford but he could only head straight at the keeper. There was a sense of inevitability for a second Telford goal and it came with 15 minutes left on the clock as he controlled a smart right-footed half-volley past the keeper to give his side a vital cushion. 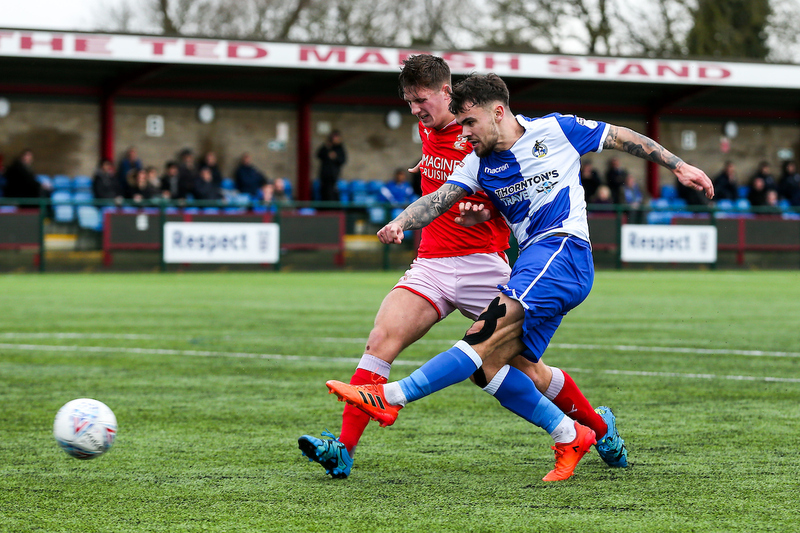 There was scare for Rovers on 83 minutes when Swindon pulled one back with a header from close range, however it was quickly quashed when Owens was brought down in the area for a penalty at the other end. Telford stepped up to convert, claiming his hat-trick and securing the victory for Rovers in the Central League contest. Rovers XI: Liam Armstrong (GK), Trialist, Luke Russe, Michael Kelly, Kris Owens, Mo Baghdadi, Cameron Hargreaves, Connor Jones, Kunle Otudeko, Dom Telford, Cameron Ebbutt (James Spruce, 85). Unused Subs: Steven Mildenhall (GK), Charlie Ten-Grotenhuis, Scott Isherwood, Trialist.